While the Pontiac GTO is often considered the first muscle car, 25 years earlier it was Buick, not Pontiac, that set the pace as America’s leading purveyor of speed and style, offering the fastest production sedan in America: the 1936–1942 Buick Century. This is its story. David Dunbar Buick began building gasoline-powered cars in 1899, but the Buick Motor Co. was not formally incorporated until 1903. Originally based in Detroit, the ailing company was purchased by Flint Wagon Works in September 1903 and reincorporated in Flint, Michigan, in January 1904. Buick was rescued from near-bankruptcy by entrepreneur William (Billy) Crapo Durant, who became Buick’s general manager and then its president. Although Durant was no engineer and by some accounts had no great love of automobiles, he quickly revitalized Buick’s fortunes. By 1908, it was America’s leading automaker, selling a whopping 8,820 cars that year. Billy Durant was nothing if not ambitious, so not long after becoming Buick president, he was already exploring the possibility of mergers with other automakers. After being rebuffed by Oldsmobile and REO, he created a holding company called General Motors in September 1908 and began selling stock. With the proceeds from that stock sale, he purchased Oldsmobile, followed in 1909 by Cadillac, Oakland, and a host of others. By 1910, GM controlled more than 30 companies, although it had accumulated so much debt that Durant was soon forced out by a bankers’ trust. Buick, now a division of GM, remained one of the corporation’s most successful and profitable brands. Its cars were relatively expensive — then as now, what we would today call near-luxury models. When Alfred P. Sloan became president of GM in the 1920s, he set Buick on the second-highest rung of GM’s price hierarchy, just below Cadillac in price and prestige. Buick sold well during the booming years of the Jazz Age. By 1923 it consistently moved more than 150,000 cars a year, third-best in the industry, and boasted handsome profit margins. The division ran into trouble in 1929. The first problem was unpopular new styling that earned the ’29 model the unflattering sobriquet of “Pregnant Buick.” It was a slap in the face for Harley Earl’s new Art & Colour division, which had been established to style all GM cars. Earl blamed Fisher Body Division, which actually built the cars and had tinkered with the proportions prior to production. In any case, the result was dismal sales that fell by more than 25% from 1928. Then, in October 1929, the stock market crashed, taking with it much of the market for expensive cars. This 1937 Buick Century’s side-mounted spare wheels were popular with conservative buyers in the late 1930s, just as padded vinyl tops would be four decades later. They cost extra on Buicks of this vintage. Stylists generally abhorred them; the body-colored covers were a grudging attempt to marry the sidemounts (which dealers often demanded) with the vogue for streamlining. Sidemount wheels are often a nightmare for restorers because their wells accumulate water and promote disastrous levels of corrosion. No high-priced cars fared well during the early years of the Great Depression, but Buick was hit particularly hard. After 1929, this was due mostly to the economy rather than any failings of the cars themselves, which were attractive, well-built, and modern. The 1931 cars had a new line of straight-eight engines, better brakes, and a much-improved clutch design. The 1932 Buicks had lovely if conservative new styling and came in a wide assortment of body styles, offered in four different sizes. It also added GM’s new Synchro-Mesh transmission, which allowed clash-free shifting into second and third gears — a highly useful innovation. None of this helped; sales were down more than 25% for 1931 and a further 53% for 1932. The 1933 total was only 40,620, Buick’s worst year since 1914. As sales dropped, Buick dealers began to jump ship; by 1934, there were fewer than 70 exclusive Buick franchises, compared to more than 2,500 before the Crash. What had once been GM’s most profitable division suddenly looked terminal. GM management talked seriously about liquidation. Buick’s salvation came in the form of a dynamic new general manager named Harlow “Red” Curtice, previously the head of GM’s AC Spark Plug division. Curtice was 39 when he took over Buick in October 1933, young for GM, and he was, in the vernacular of the time, a real live wire. Curtice was determined to turn Buick around and Sloan gave him a great deal of latitude to try. Curtice’s first salvo was a new short-wheelbase Buick called the Series 40, introduced in May 1934. With starting prices as low as $795, the Series 40 was about 20% cheaper than the least-expensive 1933 Buick. Customers responded; although 1934’s total sales were still unimpressive compared to the division’s 1920s heights, they were up 93% from 1933. Although buyers in hard times tend to gravitate towards smaller, more economical cars, the most reliable selling points tend to be the three Ss: speed, style, and snobbery. The Buick name still carried considerable snob value in those days; it was a highly respectable car, the kind a successful doctor or banker might drive. Curtice set to work on speed and style. 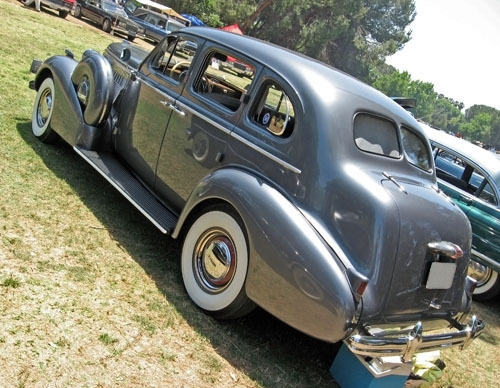 Restyled by Frank Hershey, the 1937 Buicks were several inches longer and hundreds of pounds heavier than their 1936 counterparts. This 1937 Buick Century stretches about 203 inches (5,156 mm) long on a 126-inch (3,200mm) wheelbase with a curb weight of around 3,900 pounds (1,770 kg). Base price of this model and body style was $1,233 and 21,140 were built, accounting for more than half of Century sales for 1937. Note the front and rear “Venti-Plane” vent windows, a patented innovation GM had introduced in 1933. While some GM managers were suspicious of Harley Earl, Curtice actively courted the mercurial styling chief. One of Curtice’s first acts after becoming Buick president was to ask Earl for a tour of the Art & Colour section and a crash course in automotive design. Curtice and Earl soon became friends and Earl favored Buick with some of his stylists’ slickest work. The first result was the 1936 line, whose development began shortly after Curtice came to Buick. Curtice had asked Earl for a design that would have the flair of a Cadillac, but be instantly recognizable as a Buick. 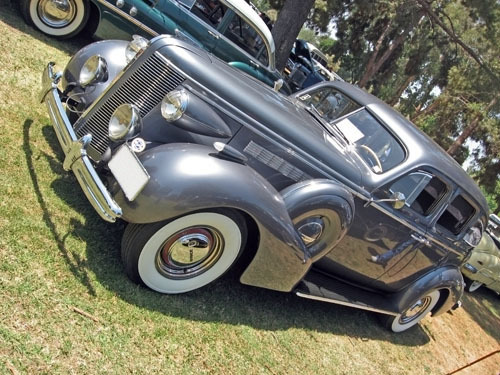 Earl delivered and the sleek, streamlined ’36s were among the industry’s best-looking cars. The new Buicks were improved under the skin as well. For 1934, Buick got independent front suspension, trading leaf springs for coils and providing much-improved handling and ride quality. For 1936, mechanically operated brakes gave way to modern hydraulics and a new, smoother, lighter Synchro-Mesh transmission was added. The 1936 cars also had “Turret Top” construction, finally abandoning the wood-and-steel composite structures to which GM had stubbornly clung in favor of all-steel bodies. Under the hood, the 1936 Buick retained overhead-valve straight eights, but the earlier 235 cu. in. (3,857 cc) and 278 cu. in. (4,588 cc) engines were dropped, leaving the base 233 cu. in. (3,819 cc) edition, with 93 hp (69 kW), and a new 320 cu. in. (5,247 cc) engine with 120 hp (90 kW). The new Buicks were stylish and modern, but Curtice also wanted them to be fast. The usual automotive practice is to put small engines in small cars and big engines in big cars, but interesting results may be had from putting a big engine in a smaller car. In 1936, Buicks came in four basic sizes: the short-wheelbase Special, the medium-size Century, the big Roadmaster, and the even bigger Limited. The Special used Buick’s small eight, but the Buick Century came standard with the same engine as the big Roadmaster and Limited. Since it was at least 9 inches (229 mm) shorter and more than 300 pounds (136 kg) lighter than its larger siblings, the mid-size Century became a rather hot number. Prestigious, pretty, and fast, the 1936 Buicks were a hit. Sales climbed to almost 180,000, up over 65% from 1935, and more than four times the dismal 1932-1933 totals. This 1937 Buick Century is a four-door “Touring Sedan,” the most popular Century body style. Other choices included the two-door Touring Sedan, standard two- and four-door sedans, a convertible coupe, a sport coupe, and a five-passenger convertible phaeton. The ungainly-looking “trunkback” is not nearly as sleek as the sport coupe or standard two-door sedan, but it was somewhat more useful. One controversial stylistic point is the exaggerated crown of the roof, added at the insistence of Fisher Body to prevent drumming in the new all-steel “Turret Top.” Stylist (and future GM styling chief) Bill Mitchell, who worked on some details of this car, thought the car looked top-heavy. The Buick line was extensively restyled for 1937. The new design, largely the work of Frank Hershey (who would later become a leading stylist for Ford), was longer, lower, and wider than the 1936 Buicks — Harley Earl’s standard formula — but still sharp-looking and modern. The Special’s smaller eight got a longer stroke, taking it to 248 cu. in. (4,065 cc) and 100 hp (75 kW), while the bigger 320 cu. in. (5,247 cc) engine on senior cars was up 10 hp (7.5 kW) to 130 hp (97 kW). With the more powerful engine, the 1937 Buick Century remained a fast car despite its additional girth. Unofficial reports showed the Century to be capable of 0-60 mph (0-97 km/h) in about 16 seconds and while it couldn’t quite crack the century mark, it was one of the fastest stock cars sold in America. Sales for 1937 were up a further 25% over 1936. Buick’s previously failing fortunes had undergone a major turnaround. 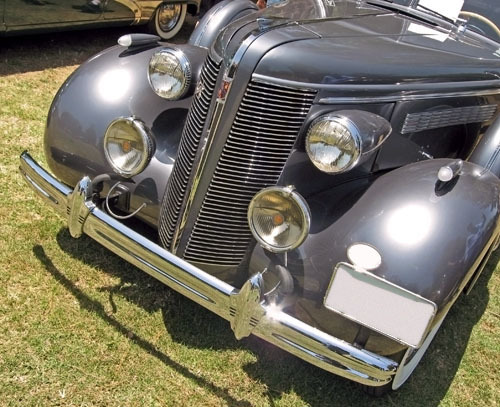 Other than the greater length and more prominent fenders, the most obvious feature of the 1937 Buick Century is the divided grille with its horizontal chrome bars, replacing 1936’s “fencer’s mask” design. The pod-mounted headlamps were a point of contention within GM at this time. Harley Earl felt they were becoming dated and wanted flush, fender-mounted headlights (which the Chrysler Airflow and Lincoln Zephyr already had), but Bill Knudsen, who became president of GM in 1937, felt they were impractical. 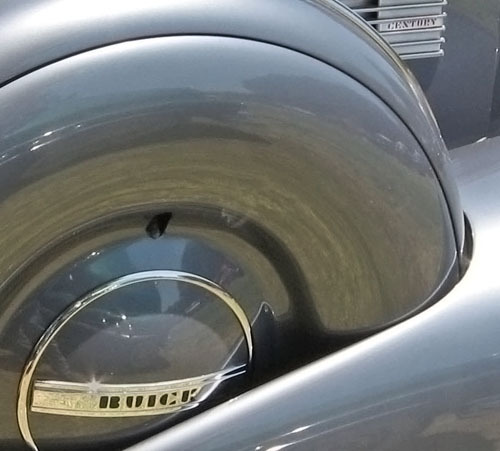 GM production cars wouldn’t have flush headlamps until 1940. Harlow Curtice wasn’t satisfied with being only one of the fastest and asked Charles Chayne, Buick’s new chief engineer, to see if more power could be extracted from the big engine. For 1938, the 320 cu. in. (5,247 cc) version, renamed “Dynaflash 8,” got new combustion chambers, relocated valves and spark plugs, and a higher compression ratio that boosted advertised output from 130 to 141 horsepower (97 to 105 kW). The new Buick Century could reach 60 mph (97 km/h) in a little over 13 seconds and hit speeds of up to 103 mph (165 km/h). The supercharged Cord 812 could give the Buick a run for its money, but the only stock cars of the time that could decisively outrun a Century were a handful of rare and expensive European exotics like the Bugatti Type 57, Alfa Romeo 8C 2900, and Jaguar SS 100. Curtice and Chayne had an even hotter Century up their sleeves. 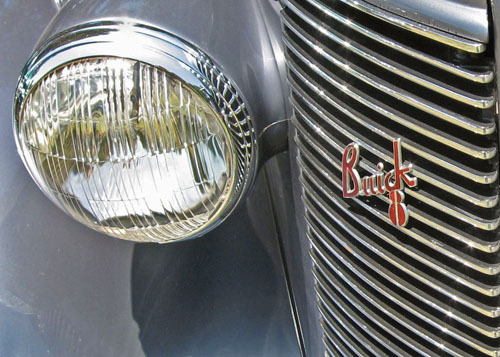 For 1941, larger Buicks got a redesigned “Fireball 8” with a higher 7.0:1 compression ratio, smaller spark plugs, and “Compound Carburetion”: a pair of dual-throat carburetors with a progressive linkage. The engine operated on the front carb in normal driving, but when the throttle was pressed down, the rear carb would cut in as well, giving a significant improvement in power. With Compound Carburetion, the big Fireball 8 made 165 gross horsepower (123 kW) and 278 lb-ft (376 N-m) of torque. Since Cadillac and Packard had dropped their big multicylinder (V-12 and V-16) engines the previous year, the 1941 Buick Century was now America’s most powerful car, beating Packard by 5 hp (3 kW) and Cadillac by 15 hp (11 kW). GM testing claimed the 1941 Buick Century could reach 60 mph (97 km/h) in about 12 seconds and had a top speed of 101 mph (162 km/h). To put that in perspective, such speed made the Century every bit as quick as the Oldsmobile Rocket 88s and Hudson Hornets that tore up the stock car circuit in the late forties and early fifties — racy performance indeed. Alas, Compound Carburetion was short-lived, offered only in 1941 and the truncated 1942 model year. The new spark plugs created oil-sealing problems, the compression ratio demanded a higher octane rating than most contemporary gasoline could offer, and mechanics found that keeping the dual carburetors properly tuned was troublesome. Worse, drivers who regularly took advantage of the dual carburetors paid the price in fuel economy. During the war, most civilian drivers were limited to at most 5 gallons (18.9 liters) of fuel a week, prompting Buick owners and dealers to convert Compound Carburetion engines back to single carburetors and taking measures to reduce the compression ratio, which trimmed power to 150 hp (112 kW). Another impressive effort that proved a bridge too far was the Buick Limited. Hoping to further boost Buick’s image, Curtice had contracted with the coachbuilder Brunn & Company in Buffalo, New York to offer custom-built bodies for Buick’s largest chassis. Cadillac management complained that Buick was overstepping its bounds and the custom-built Limited was dropped in 1941 after only a handful had been sold. Despite those minor missteps, Curtice’s revival of Buick was an overwhelming success. By 1938, the division had climbed from seventh place in the industry to fourth, just behind Chevrolet, Ford, and Plymouth. It would remain in fourth place for much of the next two decades, occasionally reaching as high as third. Even better, Curtice’s efforts had restored the faith of Buick dealers — the number of franchises grew from 67 in 1934 to almost 3,000 in 1941. Each of those dealers enjoyed higher average sales than any other make sold in the United States. The division’s fortunes were further swelled by a lucrative series of wartime contracts, including aircraft engines and the M18 Hellcat tank destroyer (whose transmission provided the basis of the postwar Dynaflow automatic). In 1948, Curtice was rewarded for his efforts with a promotion to corporate executive vice president, leaving Buick in the hands of Ivan Wiles, his former comptroller. In 1953 Curtice became president of General Motors, a post he held until his retirement in 1958. He died in the fall of 1962. Buick’s fortunes would rise and fall over the subsequent decades, reaching its greatest success in the early 1980s. (Its best year was 1985, the only year the division’s sales ever topped 1 million units.) Although it could never seem to shake its stolid, middle-class image, Buick made several other stabs at high performance, including the formidable Gran Sports, the turbocharged Grand Nationals of 1984-1987, and the fearsome limited-production 1987 GNX. The rare 400 cu. in. 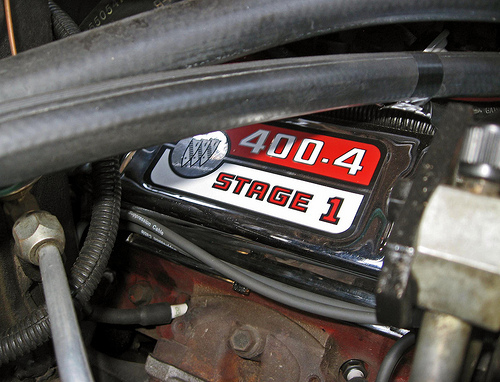 (6,544 cc) Stage 1 engine, seen here in a 1969 Buick GS400. This dealer-installed option, which included forged pistons, a hotter camshaft, and higher-compression heads, was ostensibly good for a five-horsepower boost over the standard 400-4V engine, but it was certainly stronger than that. It was followed in 1970 by the monstrous 455 cu. in. (7,468 cc) Stage 1, which was conservatively rated at 360 horsepower and 510 lb-ft of torque. By the 21st century, Buick had fallen on hard times. Its 2007 sales were down to about 186,000, the lowest since 1946, and only 90 exclusive Buick dealerships remain. Although Buicks are also sold through more than 2,700 multiple-franchise dealers, the average vendor moves only three Buick cars a month. At the time this article was originally written, it looked like Buick was bleeding to death, sustained only by the brand’s popularity in China. With the demise of Pontiac and Saturn, however, it has become GM’s sole midsize brand and is now receiving new products, intended to position it as an American alternative to Lexus and Infiniti. It’s too soon to say how well that strategy will work, but it appears that GM’s oldest brand may enjoy at least one more renaissance — including some surprisingly sporty sedans. We find that heartening; Buick’s ignominious demise would have been a sad ending for the automaker that was the foundation of General Motors — and that once made some of the fastest cars on the road. Our sources for this article included the Auto Editors of Consumer Guide, Encyclopedia of American Cars: Over 65 Years of Automotive History, (Lincolnwood, IL: Publications International, 1996); William C. Anderson, “Charles A. Chayne: Buick’s Unsung Hero,” The Buick Bugle September 2003, pp. 3-6; “Curtice, Harlow – Generations of GM,” GM Heritage Center, n.d., history.gmheritagecenter. com/ wiki/ index.php/ Curtice,_Harlow, accessed 20 May 2010; Terry B. Dunham and Lawrence R. Gustin, The Buick: A Complete History (An Automobile Quarterly Magnificent Marque Book) (Kurtztown, PA: Automobile Quarterly, 1980); Jim Dunne and Jan P. Norbye, Buick 1946-1978: The Classic Postwar Years, Second Edition (Osceola, WI: MBI, Inc./Motorbooks International, 1993); Franklin Q. Hershey with J.M. Fenster, “Glory Days! My 35 Years as an Automobile Designer,” Automobile Quarterly Vol. 27 No. 1 (1987), pp. 14-31; Dave Holls and Michael Lamm, A Century of Automotive Style: 100 Years of American Car Design (Stockton, CA: Lamm-Morada Publishing Co. Inc., 1997), pp. 84-118; Tim Howley, “1938: Century of Greatness,” Hemmings Classic Car #16 (January 2006), pp. 50–57; Beverly Rae Kimes, ed., Standard Catalog of American Cars 1805-1942, Second Edition (Iola, WI: Krause Publications, Inc., 1989); Michael Lamm, “driveReport: 1941 Buick Phaeton,” Special Interest Autos #6 (July-August 1971), both of which are reprinted in The Hemmings Book of Buicks: driveReports from Special Interest Autos magazine, ed. Terry Ehrich (Bennington, VT: Hemmings Motor News, 2001); Wilfred Leland, Master of Precision (Great Lakes Books Publication) (Chicago, IL: Wayne State University Press, 1996); Michael Sedgwick, Classic Cars of the 1930’s and 1940’s, 2nd ed. (Twickenham, England: Tiger Books International PLC, 1997); and Josiah Work, “Depression-Bred Beauty: 1932 Buick 60,” Special Interest Autos #128, March-April 1992; Tim Howley, “SIA comparisonReport: 1938 Buick vs. 1938 LaSalle,” Special Interest Autos #126 (November-December 1991); and Michael Lamm, “driveReport: 1941 Buick Phaeton,” Special Interest Autos #6 (July-August 1971), reprinted in The Hemmings Book of Buicks. Most of what I have read over the years has led me to believe that horsepower ratings of that era were not only “gross” figures, but in many cases overstated as well. Could you expand on your statement? Not argueing the point at all, just curious. If we consider the 455 Stage 1’s rated power compared to its likely output in the modern SAE net system, it was at least a little overstated. However, almost [i]all[/i] American cars of that period were rated using the gross system; if we compare the 455 Stage 1 to the gross ratings of other contemporary engines, it was probably understated a fair bit. It was certainly more powerful than the previous year’s 400 cu. in. Stage 1, which carried the same horsepower rating. (It’s worth noting that the 455 Stage 1’s gross torque rating was actually 20 lb-ft higher than a 426 Hemi, which was rated 425 gross horsepower and, toward the end, something like 375 net. Aside from the vagaries of gross and net ratings, Buick, like Pontiac in the same period, was bound by a corporate policy that limited GM cars (except the Corvette) to no more than one advertised horsepower per 10 pounds of base curb weight. (There were a couple of occasions where one or another of the divisions violated this rule, but those were the exception.) The upshot of that was that the ratings of some of the hotter GM engines, like the later Pontiac Ram Air III and IV, were understated to comply with at least the letter of the corporate policy. Pontiac executives said as much to the press on a number of occasions, although Buick was a little more circumspect. So, it was entirely possible for an engine of that period to be simultaneously overstated and understated. Fun, huh? Thanks for this article. This gives me an understanding of my now deceased father-in-law’s love of Buicks. He was born in 1922 and was loyal to the Buick nameplate his entire life owning along the way interesting Buicks including a 1964 Riveria, a Boattail Riv, and his near favorite, the front wheel drive 1982 Riv. His favorite however was his first car, a 1938 Century, bought after the Second World War. Now I understand the beginning of a lifetime passion. I found this a really interesting article, I always knew they were an under appreciated performance brand. What drives me crazy is the missed opportunity with the current Buicks. I look around and see a sea of BMWs, Mercedes, Lexus IS’s and Chrysler 300s, and all GM can muster is a Cadillac CTS with styling that isn’t to everyones taste. Buick should have a RWD car to compete in this class. It should also have a V8, to compete with the Chrysler LX cars. It is too bad they dropped the smaller Northstar V8. They don’t need a corvette V8, just small V8 is all that is necessary to be competitive. Its to bad they couldn’t put their current LaCrosse on the CTS frame and be a real competitor with BMW et all. I own a 2007 Buick Lucerne CX with the 3.8L V6. I have had absolutely zero problems with this car since I’ve owned it, proving that an American company like Buick can still make a quality car. LaCrosse is not a luxury car. When I was junior in High school, I had a 1937 4door slant back, sidemounted Century sedan! My Father removed the compound carbs from his 1942 Roadmaster, and I installed them on my Buick. I had the Fastest car in school !! Even the rich guys with new cars couldn’t beat my Century. The only thing that came close was a 1950 88 olds. He could get me a little to 80 , but from then on the Buick took over. Almost the same, Joe! Had a ’38 Century 4door trunk back that I installed compound carb setup from a ’41. Mid-fifties high school student. Never lost a race with my buddies, who all had Ford V-8’s. Driving home one day and noticed right hood flapping. Here they had opened it up to see what engine it had and didn’t lock it tightly. Interesting article I recall my aunt buying a 41 Buick right at the end of WW ll it had the dual carbs set up – my uncle returned from working up in the Columbia River Gorge and lifted the hood , I can still recall his remarks = “J_ _ _ _ C_ _ _ _t this thing can’t burn enough gas with one carb they put 2 of the D_ _ things on IT” . Looking for a clean 38 buick 4 door if u know of one call me — boston mass. I have a 1940 Buick Special and a 1941 Buick Roadmaster. I love both cars. The side mounts on the 40 make it more stylish but that compound carburation on the 41 will even surprise some modern cars these days. I took the 41 out this morning. As an ex (sob) owner of a 41 Buick Century two door fastback coupe, i can also attest that the duel carburetor setup was a serious pain to keep working. The flat spot I never could get out and the reversal of torque was awful until it came in and started working. 70 mph in second was something else. Now, a car I very much regret selling. I own an original 41 Century Sedanette and it is indeed fast enough to cruise at modern speeds.It is the most satisfying vintage prewar car I have ever owned. It is just beautiful to look at an art deco masterpiece. It has a gorgeous comfortable cabin with one of the handsomest dash boards of the 40’s with machine turned panels ivory knobs and steering wheel and gauges in ivory and copper tone white and red.This is a luxurious car rivaling Cadillac for quality and comfort. Once in third its good down to 20 miles per hour up to 100 and almost feels like an automatic. Starting off is usually in 2nd gear as recommended by the factory except for hill starts.It does have duel carbs but the factory did not use matching carbs and the rear unit be Stromberg or Carter as they used both would only have an idle circuit and a main jet circuit with no choke or accelerator pump. I matched my carbs and switched to a parallel linkage and the difference is more power off idle and an even mixture across the long manifold. Horsepower is now up to about 170 hp. The 42 is quite fabulous but even harder to find. They only made 225 or so 41 Century 2 door sedanette business coupes and none are know to survive. I’m envious — the fastback Century is a fabulous car, and I’ve long suspected it was the model for the contemporary comic book Batmobile. Dealers did it at the time in response to customer complaints, although where you’d find the parts for it now is an entirely different matter. That’s about as much as I feel qualified to say, since I’m not a mechanic, nor am I an expert on Buick straight-eights. Great article, oddly enough the only reason the Buick nameplate survives today is because of the Chinese. When GM was in bankruptcy GM was faced with eliminating a number of nameplates. one choice came down to Buick and Pontiac. Because Buick sold more units in China than Buick and Pontiac combined in the U.S. sealed Pontiacs fate. How sad it would have been for the cornerstone of General Motors had been eliminated. After the Oldsmobile got the ax there was movement in the corporation to eliminate Buick next. looking at the 90’s Buick had entry in only 26% of the auto market, and effectively was being starved of product. think of it this way, only 1 out of 4 auto shoppers had reason to even enter a Buick showroom. At that time the average age of the Buick buyer was OVER 65 years of age! Things have not changed much as Buick is still being starved of product to this day. Management is falling back into the bad habits of the 90’s and early 2000’s. hopefully they will turn it around and get back to building high quality exciting product soon. I simply can’t see GM learning anything soon. Mostly the Big Three as they were have been like rabbits caught in headlights since the 1973 gas crunch. In particular they never grasped the importance of advanced product planning and quality control. The causes of the current farce that the American auto industry has become are many and varied, I think it essentially boils down to lack of investment in R&D and rewards in no way related to promoting long term viability. Well, U.S. automakers a decade ago managed to convince the government to bail them out so that they could go on making many of the same mistakes with no consequences except to their workforce, suppliers, and creditors. It looks like in another five years, the U.S. market will offer no “cooking” models except an assortment of spyware-laden SUVs bolstered by a handful of C- and D-segment holdouts from Korean and Japanese manufacturers.